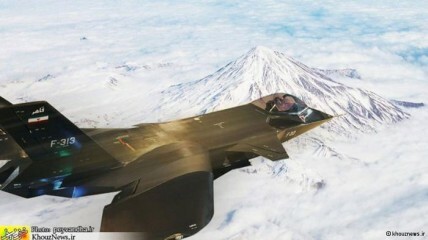 Iranian bloggers revealed earlier this month that an official photo showing Iran’s recently unveiled stealth fighter, the Qaher-313, in flight is in fact a fake photoshopped image. Despite claims by the Iranian government that the aircraft is patrolling the skies, sharp-eyed bloggers spotted that the image was taken from the unveiling ceremony in Tehran and superimposed onto a different background. While many Iranians (possibly including the military) have taken to Facebook to excitedly promote the Qaher-313, many bloggers view the image as an opportunity to mock the Tehran regime. Adding substance to their mockery are allegations that the photograph of a monkey that Iran supposedly sent into space is also a fake. We cannot trust the Islamic Republic’s claims until we see this fighter in flight, because the government has a very bad reputation for making fake photoshopped photos and presenting models instead of the real thing. Some bloggers reminded that there are far more important concerns for the country rather than building a new fighter aircraft. People want bread, not fighters. If only we could feed hungry people with missiles and bullets! 666Sabz published several photos and compared the Qaher-313 with foreign models, noting that Qaher’s cockpit is very small. Tweatter wrote that after the glorious return of the space monkey, the Islamic Republic is now looking for a stupid monkey to become the pilot of Qaher-313. Accordingly, the Qaher-313 has provided bloggers and skeptics alike with further opportunities to mock the Iranian government’s self-declared military might. Indeed, the following video demonstrates that the mockery goes beyond Tehran’s alleged fifth-generation fighter.